The bar graph shows the probabilities of magnitude-6.7 or greater quakes striking seven of California's faults over the next 30 years. 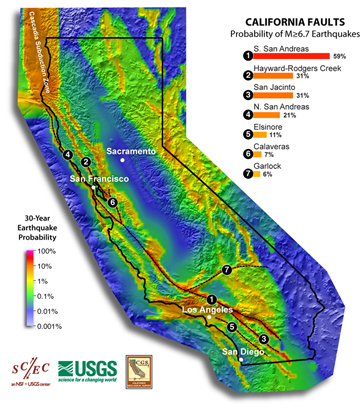 The fault with the highest probability is the southern San Andreas — 59 percent in the next 30 years. A new study by the U.S. Geological Survey (USGS) predicts that California will experience a major earthquake — one equal to or greater than the 1994 Northridge earthquake that was responsible for collapsing parts of Los Angeles' freeways and causing $25 billion in damage — in the next 30 years. And it's more than just a possibility. According to USGS, it’s pretty much certain. To create the new assessment, researchers used a model that combines seismology, geology and geodesy to create statewide probabilities of earthquakes over the next 30 years. They found a 99.7 percent probability that the state would experience a magnitude-6.7 or larger earthquake by 2038. Exactly which of California’s 300 faults might rupture, or exactly when, is unknown. Southern California is at slightly higher risk than Northern California: The chance that a magnitude-6.7 quake will strike greater Los Angeles is 67 percent. The probability of the same sized temblor striking the San Francisco area is 63 percent. Experts say that the fault with the highest probability — 59 percent likelihood — of generating at least one 6.7 or larger quake is the southern portion of the San Andreas Fault, which runs 1,300 kilometers across southern and western California, including beneath the eastern suburbs of Los Angeles. In Northern California, the Hayward-Rodgers Creek fault zone is the most likely to shake, with a 31 percent chance of generating at least a 6.7 quake. The Hayward fault zone runs beneath eastern San Francisco and the East Bay suburbs, including Berkeley and Oakland. The last major earthquake on this fault was in 1868, but activity in October 2007 rattled San Jose and other Bay Area cities. Earthquakes of magnitude 6.7 can cause extensive damage and deaths, as shown by the magnitude-6.7 Northridge quake, which killed more than 70 people and injured close to 10,000, and the magnitude-6.9 Loma Prieta quake in 1989 that disrupted the World Series and killed 63 people. This is the first time that probabilities of large earthquakes can be forecast up to 30 years in advance for the entire state, according to USGS. "This new, comprehensive forecast advances our understanding of earthquakes and pulls together existing research with new techniques and data," said Ned Field, a USGS geophysicist in Pasadena, when USGS released the report yesterday. "Planners, decision-makers and California residents can use this information to improve public safety and mitigate damage before the next destructive earthquake occurs." Everybody in California knows they live in earthquake country, where some 10,000 earthquakes strike each year (though most are too small to be felt), so it’s simply a matter of being prepared, USGS said. The new results don’t change the fact that the probability of a magnitude-7.5 or larger quake striking anywhere in California in any given year is still only about 2 percent.